ROUTER MACHINE SAYAKA Co. Ltd. 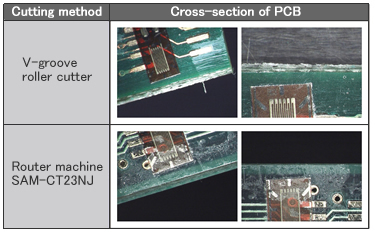 There is little distortion on PCB during cutting because using high-frequency spindle motor. It is 1/10 of pressing, 1/100 of breaking by hand. Smooth cutting finish only by router cutting. Able to cut liner and arc with router machine, diminish the restriction on PCB design. 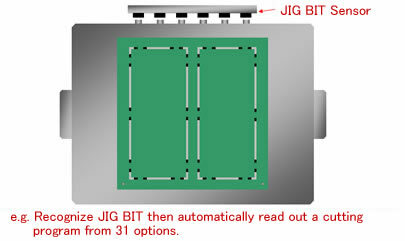 Read QR code or JIG BIT auto select cutting program, or check accordance between cutting program and JIG. Powerful Dust Collection minimized dust adhesion on PCB. Developed high performance router bit that expanded bit life and relief littering. Cut down running cost because without mold. We provide various router machine to meet customer’s need. Any request please feel free to contact us.